Russia’s UNESCO World Heritage Site, the Kamchatka Peninsula, now offers a unique attraction for tourists: an all-ice igloo hotel. Fancy a night in an icy room, on a bed of ice with subzero temperatures outside? Of course you do! Everything in the hotel rooms is made of ice, including the bed. The owners promise it’s impossible to freeze during sleep thanks to a special sandwich system that will keep customers warm: a polystyrene mat is laid on top of the ice, followed by fur skins, topped with extreme weather-resistant sleeping bags. “This hotel is the first of its kind in Russia. And the first to greet the new day in Russia are the Kamchadals (the native people of the Kamchatka region). That’s why we decided to build it here, on the Kamchatka Peninsula. 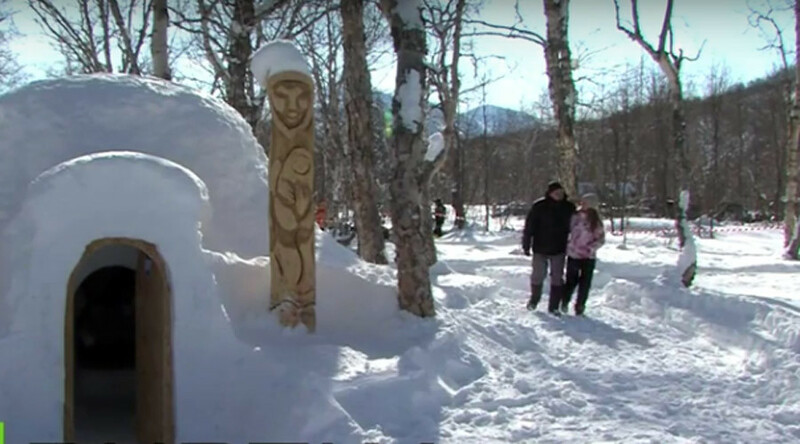 My friends are all here and the weather and snow work well,” the boss of the igloo project, Vitaliy Lazo, told RT. The project, set to last for a few months until spring kicks in around May, boasts several igloos that accommodate two to six people as well as a swimming pool with thermal water, shower rooms and a canteen. “This project really is a 100 percent ecological. When we leave, there won’t be a single trace that there was a hotel here,” Lazo said. Native Kamchadals don’t live in igloos and never have. They do, however, build temporary shelters out of branches and snow when out hunting. The same idea applies to the igloo hotel: it’s only meant for sleeping. During the day tourists are encouraged to go sightseeing. The Kamchatka peninsula lies between the Pacific Ocean and the Sea of Okhotsk, famous for its volcanoes. Popular with snowboarders for its freeride options, a few years ago Kamchatka started attracting other extreme-sports lovers. Surfers started coming to the Peninsula to cut the icy waves of Russia’s northern gem.